“The recent play for sports betting exclusivity is an outrageous money grab by two tribes that have played by their own rules for too long. “Enough is enough. It’s time Connecticut leveled the playing field, and put fairness, jobs, and economic opportunity ahead of these privileged tribes. and preserve their fortunes. The tribes are holding the state hostage – sports betting is their ransom. My name is Richard Velky, I am the Chief Schaghticoke Tribal Nation since 1987. I speak to you today in favor of House Bill 7319, An Act Concerning a Request for Proposals for a Casino Gaming Facility in the State. The Schaghticoke’ s 300 years of state recognition as a tribe make us one of Connecticut’s First Families. In that time we have witnessed our state’s entire history through the prism of broken promises and stolen opportunities. But today we see a genuine opportunity for true economic development and job creation through the establishment of the state’s first commercial gaming operation, one that finally gives us a chance to compete on a level playing field. This opportunity was nearly squandered with the hasty passage of Special Act 15-7 in 2015, which essentially awarded a gaming monopoly to the Mashantuckets and Mohegans. This Special Act and legislation proposed this year to implement it – Senate Bill 957 – would bring a limited gaming facility to northern Connecticut, designed more to disrupt MGM’s $1 billion casino investment in Springfield than to spur any true economic growth. Fortunately support for that bill seems to be waning, as it should – if we’re going to do this, citizens need to demand a better deal. We are now presented with legislation that does demand a better deal by significantly raising the level of investment and commitment required. The state needs to realize the full potential of commercial gaming here – millions more in new annual revenues and thousands of well-paying jobs – rather than treat this as a spoiler for a new casino just over the border. This bill finally takes the opportunity seriously. It does so by requiring a minimum investment of $500 million – substantially higher than what MMCT has planned in East Windsor – a higher percentage of gross gaming revenue and, yes, a competitive and open process. STN stands ready, willing and able to compete for the right to offer commercial casino gaming in southwestern Connecticut, and this bill creates the necessary pathway. Several years ago, we conducted a preliminary assessment of potential casino-gaming facility sites, and determined a new commercial casino located in western or southwestern Connecticut would be economically viable. Additionally, a study done last year shows southwestern Connecticut has five times the value for gaming development than north central Connecticut. Before the U.S. Interior Department bowed to political pressure and stripped our hard-earned federal recognition in 2005, our tribe had backing and support from several high profile casino-minded investors. We created relationships and drew up plans with developers, investors, casino operators, local mayors and representatives of other recognized tribes. We had the vision, the relationships and the backing to do it then, just as we do today. All we need is a chance to compete and a pathway to success. House Bill 7319 gives us that chance by demanding a better deal for Connecticut. In addition to my testimony today, I would like to submit the attached Economic Impact Study, done in 2016 by Strategic Market Advisors of Portsmouth, NH, for your consideration. This study examined the potential of Southwestern Connecticut as a gaming market for the State of Connecticut, and it shows that Southwestern Connecticut – with its immediate accessibility to the tri-state area of Connecticut, Rhode Island and New York – has an estimated gross gaming revenue of $3.8 billion. This is roughly five times the value of the area between Hartford and Springfield, where a scaled down slot-house casino is being considered in East Windsor. A casino in Southwestern Connecticut would create thousands of jobs where they are needed the most, and would offer a high-quality gaming operation within the proximity of a much more populated area, as opposed to a smaller venue made up merely of slot machines and table operations in a much more limited market. Thank you for taking the time to review and consider the findings of this study, and we are happy to discuss this in greater detail with you at your convenience. Chairman Larson, Chairman Guglielmo, Chairman Verrengia, Vice Chairs, Ranking Members and Committee members, thank you for inviting me to testify today on this critically important matter. My name is Chief Richard Velky – I have been the Chief of the Schaghticoke Tribal Nation since 1987 and I speak to you as a representative of more than 300 members of our Tribe in Western Connecticut. 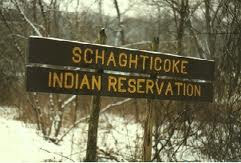 The Colony of Connecticut formally recognized Schaghticoke Tribal Nation’s reservation in 1736 – making it one of the oldest tribal reservations in the United States. Schaghticoke Tribal Nation was then recognized by the State when Connecticut became part of the United States of America, and has continuously remained a State-recognized tribe since that time. Today, Schaghticoke Tribal Nation has a 400-acre reservation in Litchfield County, Connecticut, within the boundaries of the Town of Kent. The Schaghticoke started the process of pursuing federal recognition in 1981. The Bureau of Indian Affairs reviewed our application and conducted fact-finding proceedings over the next two decades. The review process yielded tens of thousands of pages of records documenting the Schaghticoke’s longstanding existence as a cohesive tribal nation in western Connecticut. In February 2004 – more than 20 years after the process began – we received sovereignty and federal recognition. Unfortunately, State and federal officials engaged in unprecedented acts to pressure the Interior Department to reverse its decision to formally recognize the Schaghticoke and enabling the Mashantucket Pequot and the Mohegan Tribe’s to maintain their sole rights to conduct casino gaming within the State but exclusively on tribal lands. Fortunately, federal recognition would not be required to participate in commercial gaming operations. As a matter of law, should the State of Connecticut decide to establish a new Commercial Gaming industry where the State is responsible for regulating gaming operations located off of tribal lands, there would be no prohibition on the Schaghticoke’s ability to be considered. Schaghticoke Tribal Nation has proven its longstanding commitment to pursuing gaming operations as a form of economic-development. We are ready willing and able to compete for the right to offer commercial casino gaming in Connecticut. Several years ago, we conducted a preliminary assessment of potential casino-gaming facility sites and determined that a new commercial casino located in western or southwestern Connecticut would be economically viable, working on its own or as part of a partnership or joint venture with a third party, including parties located outside of Connecticut. During the time period when we were seeking federal recognition, prior to the Interior Department’s withdrawal of our federal recognition, we had backing and support from several high profile, in-state and out-of-state casino-minded investors. In particular, we had numerous formal and informal plans, meetings, and/or deals with these developers, investors, casino operators, as well as local mayors and representatives of other recognized tribes, concerning a potential partnership or deal to develop a casino in Bridgeport or elsewhere in Connecticut. Now that the state of Connecticut is considering commercial gaming we have continued to seek various funding sources. However, it is impossible to secure required financing from reputable banks, gaming operators, or real-estate development corporations without an underlying law that would enable us to, at the very least, compete for the right to operate a commercial gaming establishment. This is Nearly a $4 Billion Gaming Market – Even while the combined gross gaming revenue of Foxwoods and Mohegan Sun fell to $1.6 billion in 2015 the gaming market comprised of Connecticut, Rhode Island and eastern New York experienced a compounded annual growth rate of 2.5% between 2006 and 2015 with an estimated combined gross gaming revenue in 2016 of $3.8 billion. The Southwestern Part of Connecticut is an Ideal Location for a New Commercial Casino – The southwestern part of the state’s economy is closely related to that of New York City, and accordingly is densely populated and features relatively high incomes. A casino in this area would be more proximate to New York and could therefore be expected to attract from a more highly populated area. Given the market potential, an operator or investor in the Southwestern part of the state would enable us to secure an investor with sufficient capital to offer more slot machines and table games as well as the infrastructure to accommodate more guests including parking, dining, and a broader array of amenities including a hotel. This cannot be said of a satellite casino planned by MMCT. On January 7, 2017 the Journal Inquirer reported that MMCT had selected the towns of East Windsor and Windsor Locks “after a detailed economic analysis” – HOWEVER, MMCT has never released the actual updated economic analysis that is the basis of its choice of location. I respectfully call upon this Committee to formally request that MMCT make its updated economic analysis public so that any purported benefit to the State of Connecticut in the way of job creation, tax revenue, capital investment, and potential vendor contracts can be compared to those offered by our proposal. It is our contention that our study proves out the proposition that if properly taxed a new commercial casino located in the southwestern section of the state would sufficiently offset any potential loss of revenue the state could suffer by allowing a third party to operate the commercial casino while at the same time creating a net gain in the state’s employment rate, and key net economic indicators. The Secretary of the State’s Office initially approved our tribal business entity, issuing it business ID 1196424 on February 2, 2016. Based on that approval, we then publicly announced that, in accordance with Section 1(b) of Special Act No. 15-7, we intended in due course to issue a request for proposals to municipalities regarding the establishment of a possible casino gaming facility. In short, Special Act 15-7 was enacted only for the benefit of the privileged tribes. In point of fact, the only difference between our tribe, the Schaghticoke Tribal Nation, and the other two tribes, Mashantucket Pequot and Mohegan is that they have enjoyed economic benefits granted exclusively to them by the state for approximately 20 years. If in fact, their proposal to build a $300 million satellite, slot house casino, specifically designed to attract Connecticut residents is in the state’s best interest they should have no problem competing against our proposal in an open, fair, transparent and competitive process. We certainly welcome the opportunity. Moreover, an open and competitive process will avoid the numerous constitutional challenges that legal experts tell me could result in years of litigation. Thank you for considering my testimony.